I just love natural, messy, beachy hair. And it’s a great look for the summer ( although if I’m honest it’s really my all year look ). I think if you have hair at least down to the tops of your shoulders, this is the way to go. I always think the less done hair looks, the more youthful it is. A bit of a do is definitely going to put some years on you. Of course if you’re young anyway, it doesn’t matter at all. But at some stage, you’re going to look in the mirror and see it’s just not working for you. I know this from personal experience. I’ve found myself in the last few years, going less and less for the blow dried look. But achieving this messy look is quite hard. It depends on so many things. The straightness or curliness of your hair for a start. Those with lovely ringlets are ahead of the game and I’m deeply envious. And if you have poker straight hair, that doesn’t even need blowdrying to look sleek, this is probably not the look for you and I’m envious of you too. But for those like me, hair not straight, not exactly curly but with a bit of a wave, it’s perfect. And surely that must be most people? My hair is madly inconsistent and the degree of waviness or straightness depends on where on my head you’re looking. The back is by far the waviest. Just as well because I can’t reach it or see it and if I’m really honest, am not that interested. I can’t see it so why should I care? The bits round my face and the top layer on the sides are the straightest, which of course is exactly where I need it to be wavy. The bits underneath seem to have more curl. And it’s a constantly changing thing as well. After I had my son 24 years ago, my hair went really wavy. Recently I’ve noticed it seems to be going straighter. But no problem for me because I now have it sussed and I have products. And products of course are everything to achieve this look. My method is to section my hair while wet. I will first section the hair up to my ear on one side and apply product, take a strand of hair and twist it, then the next strand etc and then scrunch all these twisted sections using a towel. I then do the layer just above my ear in the same way and then finally the top layer. Approximately three sections on each side depending on the thickness of your hair. So what are my secret weapons? I have 3 that I use. Not all at once but choose depending on what I want to achieve. Kaze Wave by Shu Uemera – I’ve been using this the longest since discovering it at Paul Edmonds Hair Salon. It’s a foam that disappears into your hair and gives great hold with no crunchiness at all. Easy and natural and holds the curl well. Sea Mist by John Masters Organics – I discovered this one recently and absolutely love it. It’s so easy to use because it’s a spray and gives a really natural result. It contains sea salt to give that beachy fullness to the hair and also contains lavender to protect the hair and give it a lovely fresh smell. This is quite a light hold and is perfect for travelling (they do a travel size as well) and when you’re in a bit of a hurry. It’s so quick and easy. The other good thing is that it’s all natural and organic with no chemicals which means it gets a big gold star from me. 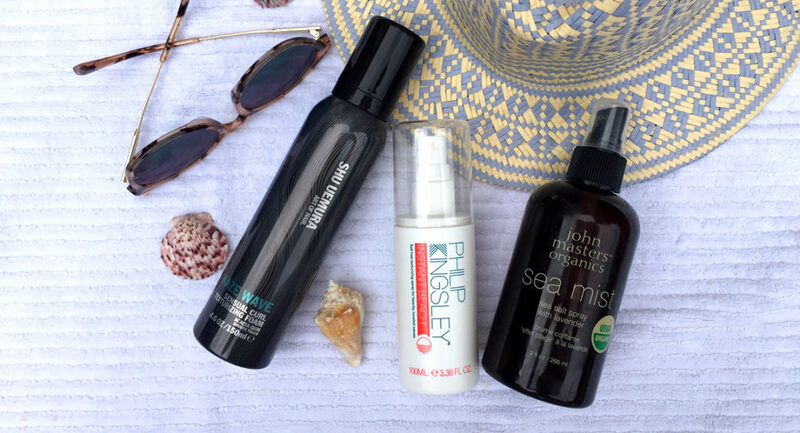 Instant Beach by Philip Kingsley – I’m a huge fan of all the innovative and ground breaking products from Philip Kingsley, so you can imagine my excitement when I heard that they’ve just launched a beach spray too. It’s salt free and conditions your hair while it works. And it gives very good hold. If you want your hair to last all day or night, this is the product for you. And a little goes a long way. Don’t do what I did and go crazy when you spray it on because it’ll go a little crunchy. I’m used to having to liberally spray product on to get a good hold so over did it. Just a light spray does the trick and leaves no residue or crunchiness. It also seems to make it wavier. And I find even if I don’t bother to section my hair and just give a quick spray and crunch, I get a good result. A totally fabulous product. I love the JMO sea mist. Must try the others.